Tuesday, Wednesday, or Thursday with the mention of this ad. These specials cannot be used in conjuction with any other specials or coupons. Must be first visit to our salon. Please mention this website promotion at the time you book appointment. Packages - Treat yourself or someone special to a luxurious day to remember! Includes facial, spa pedicure, spa manicure, shampoo/blowdry, makeover, massage...approx. 5 hours. $205. spa pedicure, spa manicure... approx 3 hrs $120. 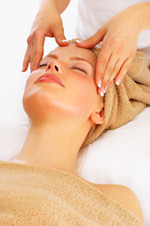 facial or 1 hr massage, makeover, shampoo, pedicure, manicure...approx. 3-1/2 hours. $145. Gift Certificates are always available and make a great gift! Get the feeling and look you Need. Gift Certificates are always available and make a fabulous present! Copyright © 1997 - 2008. All Rights Reserved. Reproduction in whole or in part without permission is prohibited.